Four Seasons is the world’s leading operator of luxury hotels and resorts. Their highly personalized service, combined with authentic, elegant surroundings of the highest quality, embodies a home away from home for those who know and appreciate the best. 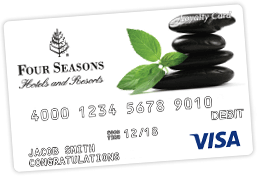 In recognition of their employee’s years of service, Four Seasons partnered with OmniCard to offer a branded reward card. A ceremony was held for these employees to highlight their years of service and acknowledge their dedication and commitment to the Four Seasons Resorts. Over 20 hotels participated in the program, and hundreds of participants received recognition this year. Recipients were very excited about their reward card and other staff members are anxious to reach their service anniversaries. Four Seasons was looking for a way to honor and reward their top employees that had dedicated over 10 years of service within their organization. They added their logo to a predesigned reward card to personalize the program for their employees. Everyone was excited about the incentive and the OmniCard team and HR Manager, Diane Kildun, made it easy for other properties to join in on the program. She worked with the OmniCard Staff to complete all paperwork for corporate and roll out the program nationwide.